ST. PAUL, Minn. -- It's safe to say July has had its ups and downs for new Minnesota Wild defenseman Ryan Suter. Obviously, the high of signing a new contract that will financially set up his family for the rest of their lives is a positive. But, being the quiet and reserved person he is, Suter admits he has not enjoyed his time in the spotlight over the past week. It began July 1, when the NHL's free agency period opened and more than half the teams in the League started to pursue him. It continued for three days while media -- and social media -- buzzed. Fans hung on every bit of information, with Suter headed for a new team seemingly every hour. Finally, on July 4, Suter and top free-agent forward Zach Parise agreed to join the Wild together, ending perhaps the craziest 72-hour free-agent chase in League history. Monday, Suter and Parise were introduced to The State of Hockey in front of a couple hundred people inside Gate 1 of the Xcel Energy Center. The setting made the Madison, Wis., native -- a man who spends the offseason secluded on a farm -- clearly uncomfortable. "Chaos," Suter said, describing the setting Monday. "It kind of caught me off guard; I didn't think there were going to be that many [media members] out there." Suter said on his farm, with few people around, the fact he was changing teams for the first time in his professional career -- leaving the Nashville Predators -- hadn't really sunk in. "With the jersey on, being here at the rink, it's starting to feel more real," Suter said, wearing his familiar No. 20. Asked if he was anxious to get back into seclusion, Suter chuckled and quickly replied, "Yes." Privacy likely will be somewhat easier for Suter to find than for hometown hero Parise, a surname synonymous with Minnesota hockey for almost 50 years. Monday was the first time Zach slipped on a No. 11 Wild sweater, taking the number his father J.P. wore with the North Stars a generation ago. 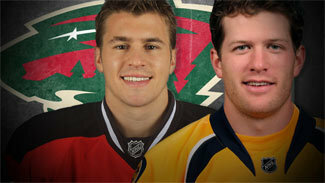 Like Suter, Parise said he was interested in finding a home where he could spend the rest of his career. As it turned out, for Parise, that new home will be, in fact, home. Born across the river in Minneapolis, Parise grew up playing youth hockey in the Twin Cities before starring for Shattuck-St. Mary's Prep School, about an hour south of St. Paul in Faribault, Minn. The former New Jersey Devils captain will join Joe Mauer from the Minnesota Twins as a hometown boy expected to be the face of his franchise for the next decade-plus. Since signing a mega-deal with the Twins two years ago, Mauer has faced immense pressure from local media and fans. Despite a sales pitch from Mauer via video to Parise and Suter last week, Parise said he hadn't spoken to Mauer about the pressures of playing at home and said he knows the challenge that awaits him. "I understand how this whole thing works," Parise said. "This is a great place to play. The fans, they care and they are passionate about the sport and the team. I understand everything that comes along with it. Ryan and I will come out and play our hardest and I think everything will work out fine." The Midwest appeal of Parise and Suter already has helped Wild owner Craig Leipold recoup some of the $196 million he spent on his two new stars. Nearly 2,000 season tickets have been sold in the five days since the duo signed matching 13-year, $98 million contracts. "And the phones are still ringing," Leipold said. The Hockey Lodge, the official team store located inside the arena, has seen a traffic jam of people snapping up Parise and Suter jerseys almost as quickly as they are made. "We're both very excited to be a part of this organization," Suter said. "We see the talent is here and we hope to add to it. It doesn't make us nervous at all." Wild general manager Chuck Fletcher called last week's announcement and Monday's introduction the "best-case scenario," admitting much planning and "pain" went into freeing enough salary-cap space to make the acquisitions possible. According to Leipold, Fletcher approached him after the season had developed a "very, very ambitious plan" to lure both Parise and Suter to Minnesota. "On Sunday morning, July 1st, we got after it," Leipold said. Leipold reiterated Monday that the players each received more lucrative offers from other teams and instead took less money to come as a package to the Wild. "Free agents of Zach and Ryan's caliber are often attracted to the major markets, where there is more attention, brighter spotlights and, frankly, more money," Leipold said. "These two chose Minnesota instead of those things, and in doing so, have transformed our franchise. "They had many options, and they chose us."